Specifies the SqlClient ConnectionString to use (can be used instead of /S /E). Specifies a report file name to run. The first scenario that I want to outline is the need to automate a report execution especially when you need to execute the reports repeatedly after activities like performance testing or during some other iterative activity which requires analysis of various sets of diagnostic data. As you can see from the screenshot below, you can see that I have a standard report i.e. “Bottleneck Analysis_C.xls” that was exported and a non-standard report which I created Summary.xls in the same folder. This also gives additional opportunity to create your own performance reports and schedule them using the SQL Nexus executable. After you have the exported reports, you could also write additional automation to email the reports as required. SQL Nexus also allows you to perform data imports automatically using the command line parameters. The command line shown below performs data import from the specified folder into a SQL Server database called sqlnexustest on the default SQL server instance installed on the machine. If the database does not exist on the SQL Server instance, then it will be created. The settings for SQL Nexus utility will be used during the data import which were saved when the last time the UI was used. So if you have disabled the profiler trace import from the UI and saved your settings, then the command line execution will not import the profiler traces. Here is another post in the Tools Tips and Tricks series which tells you some feature about SQL Nexus which is not widely used. Yes, SQL Nexus is one of my favorite tools (provided it is used correctly). Automation of analysis helps get the picture quickly but the co-relation of data has to be drawn by the person performing the analysis. Today I shall show you how you can use custom reports feature by creating simple RDL files in Visual Studio and getting SQL Nexus to use them. As you can see in the screenshot below, I have a few reports which are not part of the standard installation of SQL Nexus available on the CodePlex site. I had built this report ages ago when RML Utilities didn’t have the option of drilling through the Interesting Events and fetching out the sub-class reason for the Interesting Event. The report structure itself is quite simple. 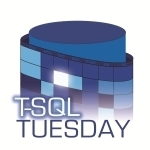 It uses the Shared Data Source “sqlnexus.rds” so that the database context can switch when you change the database name using the drop-down menu in the SQL Nexus tool. Then I created an Action Event to jump to a child report which is called “Event Drilldown.rdlc”. This gives you a view as shown in the screenshot below. 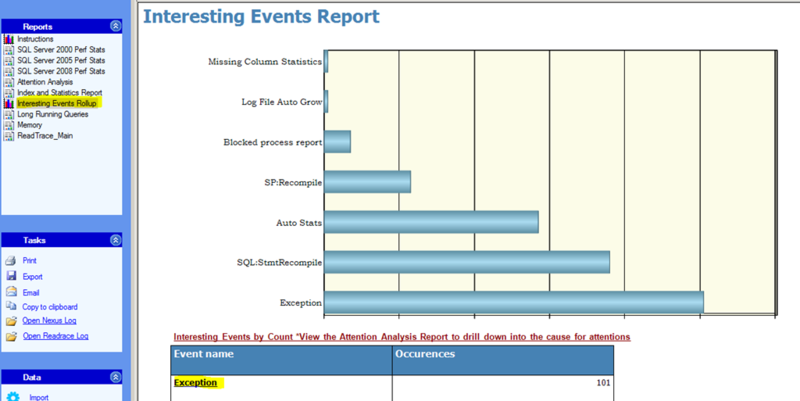 This is showing you a on which database the AutoStats event was fired and what the reason for AutoStats kicking in. Once you have the custom reports built, you can drop them in the following folder: %appdata%\SQLNexus\Reports. SQL Nexus will automatically pickup these reports when it is launched. The two files that are used in the above example can be downloaded from here. You can dissect the structures of the report to understand what queries were used to fetch the data for the reports shown above. The ReadTrace_Main report for RML Utilities provides this drill-down function currently using the “Interesting Events” link on the main dashboard under “Additional Reports”. Have a good weekend and stay tuned to this series for more tips and tricks next week!